This is when some shiny new piece of technology comes along, and everybody immediately declares it the best thing ever. Those suffering from baby duck syndrome immediately ´imprint´ on the new technology, and have issues with ever letting go. 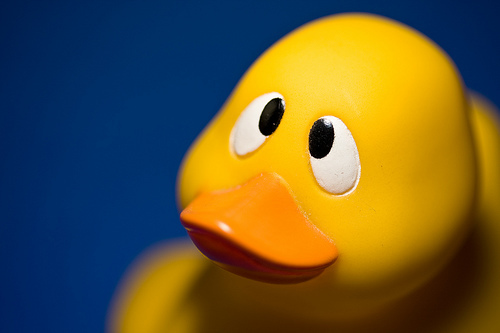 Even when flaws become increasingly apparent, those suffering from baby duck syndrome will defend the technology to the bitter end. I learnt about this cool term via an item in Stephen Downes´ (very addictive) Online Daily. An entire area of study which investigates (and rather scarily experiments with) how we can integrate machines/technology into the human body. I’m waiting for the French chip to be developed, so I can graft it into my memory and give being up the really hopeless learner of my French class. I learnt about this term in my MOOC (see below), and the field has apparently been around for decades (see this video), although it was all news to me. I do love the term though. Trawling around Wikipedia recently, I was reminded of the heated discussions that arise over obscure things. Like the heavy metal umlaut. The what? It’s the use of those double dot diacritic marks over a vowel, much beloved of heavy metal groups such as MotÖrhead. Check out more on this fascinating topic, and bore those Christmas dinner guests rigid. In a misguided attempt to get some professional development via anything longer than a tweet, I signed up for a MOOC in September. I promptly dropped out at record-breaking speed, unable to keep up. Some of the information I managed to follow did slowly filtered through though. The course was directly instrumental in me writing series of blog posts about Webs 1.0, 2.0, 3.0 and extended web, for teachers. So really, I was a model MOOC student – I repurposed course content into meaningful artefacts for myself and the wider community. How cool is that? You can do almost nothing on a course, drop out within minutes, and still feel good about it all. What cool things have you learnt in 2010? I would love to read about them in the comments section below! I learnt a whole host of really cool things through The ConsultantsE in the second half of 2010 – starting from what it feels like to be an elearner through to experimenting with moving my face to face newbie bloggers class totally online. Thank you both for two very stimulating online courses! Thanks, Ceri! I know what you mean about tripping over wires – I invariably fall flat on my face giving talks by tripping over the mic cable. The basic rule seems to be the larger the audience, the more spectacular the fall. Happy 2011! Things I have learned this year… having bought an iPhone last Jan and an iPad later – that I need to learn lots more about Apple computers and their operating system and software! I have made a mock up of an iPhone app 🙂 I enjoyed that but did not have the content to make it for real. I was experimenting with QR codes for treasure hunts for children earlier in the year. I learned to terraform virtual landscapes by creating a virtual world on my computer. As part of the team we started experimenting with a class set of ipods – learned just how easy children find using them for all sorts! I used Adobe Connect for the first time that is great software! Hi Carol, you clearly learnt lots of very interesting (and nerdy! – good for you!) things in 2010! I loved the story of the upside down bathtub, clearly not the most discrete object one could choose to have following one around the streets. I first saw Kevin Warwick in a You Tube video early this year, when I first learnt about this (to my mind) very catchy phrase cyborg anthropology: http://www.youtube.com/watch?v=RB_l7SY_ngI Pretty eye-opening stuff. And here’s to more learning in 2011!